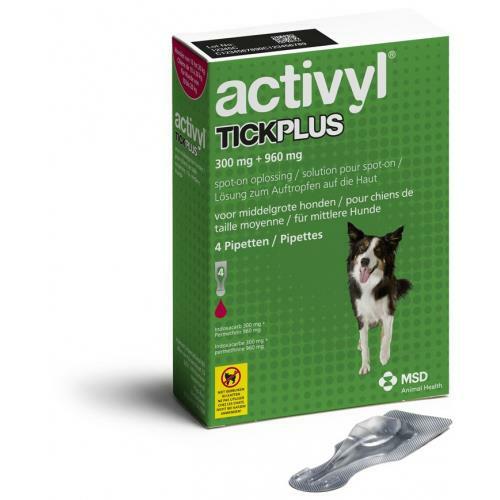 Activyl Tick Plus Spot-On for Medium Dogs is indicated for the prevention and control of flea and tick infestations in medium breed dogs. Once applied, Activyl breaks the life cycle of the flea, ensuring your pet is not re-infested and your home is kept flea free. Each 2ml pipette delivers Indoxacarb 300mg and Permethrin 960mg. It treats not only adult fleas, but also all developing stages in the immediate environment. Permethrin also has a unique capability that, unlike standard tick control products, actually repels ticks rather than disrupting their physiological processes to cause death after biting your pet. This innovative action prevents the potential of tick-bourne diseases and bite damage. Can this product be used with Stronghold Red? Yes, the ingredient is completely different so the both products can be used together.